For X'mas I had a wonderful gift from my three musketeers ~ the much awaited Cuisinart Ice Cream Maker! I'm very pleased with this gift as the freezer bowl just fits snugly in my freezer compartment without having to take out the shelves to make room for it. I was very eager to try out the much talked about yummy ice cream that the Cuisinart Ice Cream maker can churn out. I've made ice cream before, years ago with my old faithful Kenwood Chef but it was indeed time consuming as I've got to freeze and cream the mixture many times and with long waiting periods in between. Yummy, smooth Chocolate ice cream, just what you need to cool down during a hot day. Why not make this and serve to your visitors during Chinese New Year or as dessert after a sumptuous reunion dinner ...........Ooops, it's melting! Melt the chocolate, set aside. Beat the egg yolks and sugar till light and fluffy. Set aside. Sift the cocoa powder into a saucepan, then whisk in the cream, milk till smooth. Place the saucepan over medium heat, stirring till free of lumps and the milk just begins to foam up. Remove from heat and gradually pour the warm cream mixture into the whipped egg yolks, whisking constantly so as not to cook the egg yolks. If lumps form, strain the mixture. Stir in the melted chocolate. Pour the mixture back into the saucepan and place over medium low heat, stirring constantly with a wooden spoon till custard thickens enough that it coats the back of a spoon. (Wooden spoon placed in the custard and when the spoon is raised, the film of custard on the back of the spoon will stay in place even when you draw a line with your finger through the middle of the custard). Immediately remove the custard from the heat and continue to stir for a few mins. so it does not overcook. Stir in the vanilla. Cover with cling film and let cool to room temperature and refrigerate the custard until it is completely cold, preferably overnight. Churn the mixture in the ice cream maker for 25 mins. or according to the manual of your machine. Spoon the ice cream into a container and freeze it. Wishing You and your family, Happiness and Prosperity Lunar New Year, 恭喜恭喜! Help yourself, Ann! A very Happy and Prosperous New Year to you and your family too! Hi Cheah, can I have some? You are very clever. Of course you can, Kimmy. No,no I'm not clever, just like to try and experiment with new things. Wish you and your family a Happy and Prosperous New Year too! Wow, your chocolate ice-cream is so attractive. It's my family's favourite. How creamy and smooth! I need at least 2 scoops, please! Thank you, Angie. Gong xi fai cai to you and your family! Congratulations on your Cuisinart Ice Cream Maker! Your chocolate ice cream looks so creamy and delicious! Wish you and your family Gong Xi Fa Cai! Thank you..... Happy new Year to you and your family too! Thanks, Alice. Happy New Year to you and your family too! yeah, i heard that the cuisineart ice cream maker doesnt need pre freezing..i'm using the kenwood one. Happy Chinese New year to you, cheah! May the year of snake brings Good Health, Joy and Prosperity to you and your family! 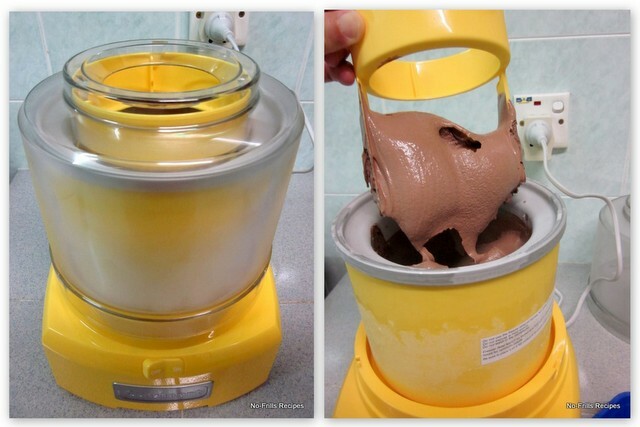 I believe Kenwood ice cream maker is fine too. Happy New year to you and your family and will your family be blessed with abundance joy, wealth and most important, health! Happy new year to you and family, how nice to receive an Cuisinart ice-cream maker,may i know did they get it from Malaysia,as i havent seen this model around KL.Would love to get one if it is available here. Hi Sem, thanks for dropping by.... maybe you can purchase this online. My girl bought in Melbourne. Howdy Cheah ! Guess, you must be busy busy busy entertaining friends & family during this time of the year. Gosh, you finally got the ice cream maker....is it listed in your wish list long ago ? haha... So, must show your wish list to the kids early.lol. I bet you're having so much fun making ice cream for hubby too. Enjoy & have fun ! And may the year to snake brings good health & good wealth to you. Yes, Kristy, very busy with travelling over CNY and now relaxing in the comfort of my home. Yup, will look for more ice cream recipes to share but getting very lazy nowadays. Good health and wealth and 'Sang yee heng loong' to you as well!